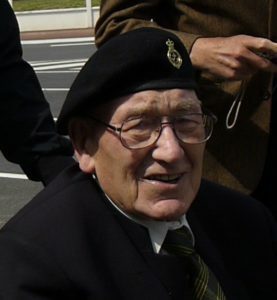 Stan Cox served with the Sherwood Rangers Yeomanry, landing with his squadron on Gold Beach, one of five beaches the Allies stormed during the Normandy landings of June 6th, 1944. After joining the Army in 1943, Stan trained on Cromwell tanks before receiving instruction on the M4 Sherman tank, which had just started to pour into Europe from America. The Shermans had more speed and a faster rate of fire than German tanks, but the Panzers had better accuracy, range, and armoring. Particularly distressing, the Shermans had a tendency to catch on fire easily, earning them the nickname “Ronson lighters.” Still, the Sherman tanks were reliable, and, with well-trained crews manning them, they could hold their own in a fight. Following six weeks of training on the Sherman, Stan joined A Squadron of the Sherwood Rangers Yeomanry. Stan found life with the Sherwood Rangers to be almost the polar opposite of his previous experience with Army life. Everyone, even the Sergeant Major, went by their first name, and the Regiment seemed like one big happy family. Just returned from Africa where they had left their equipment, the Sherwood Rangers had no tanks to work with initially, so Stan and the rest of his new mates spent a lot of time playing different sports and sleeping in. Once the tanks arrived from America activity ratcheted up quickly, and the Regiment was kept busy with unpacking weapons and tools while the tanks were readied for service. The moment the tanks were ready, the Sherwood Rangers conducted training exercises in them until their orders came through. Stan’s A Squadron was sent to the village of Sway to waterproof their tanks and practice beach landings. At the beginning of June 1944, A Squadron was moved to Southampton where they boarded their Landing Craft Tanks (LCT), which carried their three tanks and two supply trucks. On June 4th, they anchored off the off coast of the Isle of Wight ready to head to France, but due to bad weather the landings were cancelled. The men were forced to wait aboard their LCTs for the weather to clear. They set sail late June 5th. As Stan and the others sailed through the night in the open LCT, they sought shelter wherever they could, some in the tanks themselves and others on the bow of the LCT, but the harsh rain and constant rocking was exhausting. The deck became covered in water and vomit as soldiers succumbed to seasickness. Sleep was virtually impossible. When the dawn broke, they found themselves surrounded by dozens of ships of every kind imaginable, and the sky was filled with Allied aircraft. As they neared the coast, the Sherwood Rangers prepared to land. Stan could see the fighting on the beach and knew he would soon be in the thick of it. To get the tanks onto the beach, they had to lay out coconut matting in front of the LCT so the tanks could gain traction on the sand. Stan was chosen to help roll out the matting, but a strong tide and heavy sea pulled the matting and the attached LCT back out to sea. Stan landed in the rough water and was forced to swim towards shore along with the others who had been trying to get the matting straight. While the LCT made a second attempt at landing, Stan and his mates crawled up Gold Beach under fire and quickly sought the cover of the seawall. The LCT’s second attempt was successful, and as soon as his tank was firmly on the beach Stan ran to join the rest of his crew. Their tank was taken over by their officer, and they then began pressing inland toward Bayeux in the lead. Instead of capturing the city during the night, the Sherwood Rangers lost their infantry support and were forced to pull back to an apple orchard for the night. After taking the town the next morning, they moved out towards Tilly-sur-Seulles. A few days later while near Tilly, Stan’s tank was hit by German artillery and caught fire. As the gunner, Stan worked the Sherman’s cannon around so that all the other crew members could bail out of their hatches. Once they had, he was the last out of the flaming tank. Just outside, by the tracks, Stan had a narrow miss with another round and was sprayed with shrapnel, throwing him to the ground. As Stan lay next to the tank and watched it moving at an angle, giving the impression of wanting to roll over on him. Luckily, it stopped, and Stan was carried to shelter by other crew members. The abandoned tank soon was consumed by the flames. Stan was sent back to hospital in England, where he spent nine months recovering from his injuries. In March of 1945, Stan was discharged with paralyzed left arm and a brace on one of his legs. Eventually, he recovered fully but carried the heavy scars as reminders of his short, but eventful, time in combat.